Shooting Review: The FNS-9 | Eagle Gun Range Inc.
A couple of days ago I got my hands on the new Glock 45 in 9mm. It’s the black-Gen-5 version of the Glock 19X. Basically, it’s a G19 slide with a G17 frame. Well, in actuality this same gun has been available since 2012. It’s called the FNS-9. 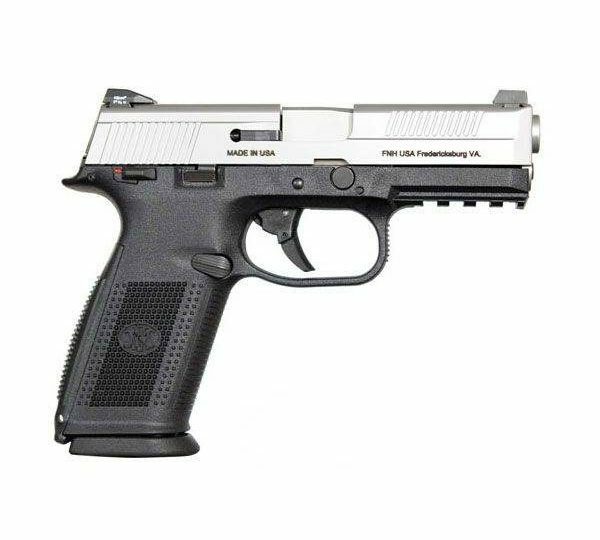 The FNS-9 is a medium-sized 9mm striker-fired pistol with a 17-round magazine capacity. As I alluded to earlier, it is quite close in size to a Glock 19, but with that 17-round magazine the grip is a bit longer, closer to that of a G17. 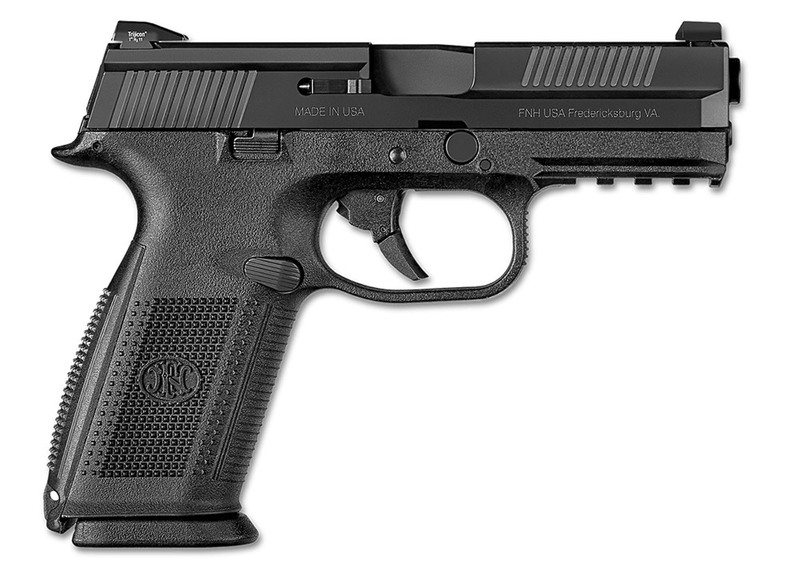 The other differences are that, out of the box, the FNS-9 has far-superior features and ergonomics to the Glock. I find it strange that this pistol is not more popular and more talked about. FN is a well respected brand. From the SCAR to the SAW to a host of other models, FN has been a military arms staple. The FNS-9 is right in the sweet spot for duty carry, but I’ve not heard of any police forces that use this model. Again, strange. I recently got the chance to shoot this pistol over a few days and here are my first impressions. Why Consider The FN FNS-9? The FNS-9 is purpose made as a duty pistol. It is almost just right for concealed carry, but that 17-round capacity makes the grip a tad too long for my taste and for easy concealment. You might consider it because you like that configuration (medium slide, full grip) and you detest the uncomfortable grip of the Glock. Because, yes, the FNS-9 is far more comfortable in the hand. But then again, what pistol isn’t more comfortable than a Glock? I feel like I should say something interesting or clever here, but shooting the FNS-9 was just comfortably boring. I ran a few hundred rounds of ball and defensive ammo through it without a hiccup. And this was on a pistol that already had a couple thousand rounds through it since it was last cleaned. Running the gun was easy. The controls all seem to be in the right place and were entirely unobtrusive; even the manual safety control (which I didn’t use) never got in the way. What I did NOT like, however, was the awful trigger. The trigger is gritty and long, with a bit of a long reset for my taste. The trigger’s safety mechanism splits the upper portion from the lower portion of the trigger shoe with a hinge. The hinge must be depressed for the trigger to actuate. Whatever…I could not perceive the hinge action while shooting, but I was never really comfortable with the trigger and when shooting rapid-fire strings I could not really find a rhythm. Were I to own an FNS-9 I’d have to spend some time smoothing out that trigger action. Despite the poor trigger I found it easy to get good accuracy from this pistol. It felt natural to shoot it for good hits. Unlike many non-Glock striker-fired pistols, the bore axis on the FNS-9 is really quite low. Correspondingly, the recoil impulse and muzzle flip are insignificant. All in all it was a comfortable, easy, and effective pistol to shoot. I like this one. I found the FNS-9 to be worlds more comfortable to grip than my EDC Glock 19. You can choose your backstrap, small or large, according to your taste. It’s plenty comfortable to shoot, too and the recoil is no better or worse than any quality 4”-barreled gun. I had no controllability issues and found it easy to both maintain a good grip and get sights back on target immediately. If you’re like me, you’ll find it useful to use the takedown lever as a support-hand thumb rest, useful in controlling muzzle flip. The grip is a tad long for easy concealability. I know folks who EDC with a Glock 17 so it’s possible, but I wouldn’t want to do it. The 17-round capacity is pretty normal for a gun/grip of this size. The FNS-9’s external controls are quite minimal. Even the superfluous safety control is unobtrusive and never got in my way. Unlike many similar models, features like the slide stop lever and takedown lever are fairly unobtrusive, too. Lots to like there. The sights are iron 3-dots, in either white dots or night sights, and both the front and rear are drift adjustable. 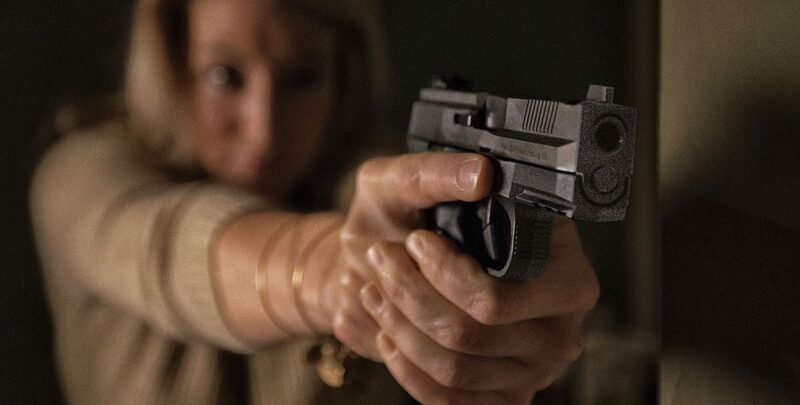 The pistol has dual-sided slide-stop levers and dual-sided magazine release controls, which will be a boon to lefties and those who shoot with either hand. Same with the manual safety control, if you opt to get a model with that feature (just don’t). The FNS-9 comes with two interchangeable backstraps and three steel magazines. Gotta love a company that puts more than two mags in the box! The steel magazines are nice and so much better than polymer mags. The 4” stainless steel barrel rides under a stainless steel slide that has serrations both forward and aft. They’re plenty grippy. The polymer frame has a MIL-spec 1913 accessory rail up front and is otherwise nicely minimal, with something of a beavertail on the back. 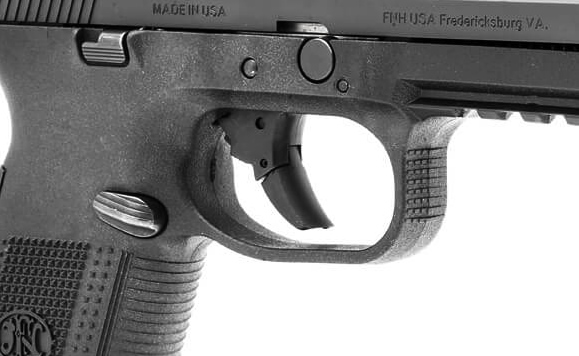 The trigger guard is large enough to accommodate a gloved hand (a nice feature!) and has texture on the front…for if you’re a huge, monkey-handed brute who likes to put his support-hand index finger on there. The grip texture is about is good as it gets on a stock pistol. The bottom of the grip includes a lanyard hole (as do all MIL pistols). The trigger is one of the worst I’ve run on a striker-fired gun. It’s got this weird hinge that spits the trigger shoe in the middle, separating the top from the bottom. As I mentioned before, I’m not a fan of the trigger’s action or travel. 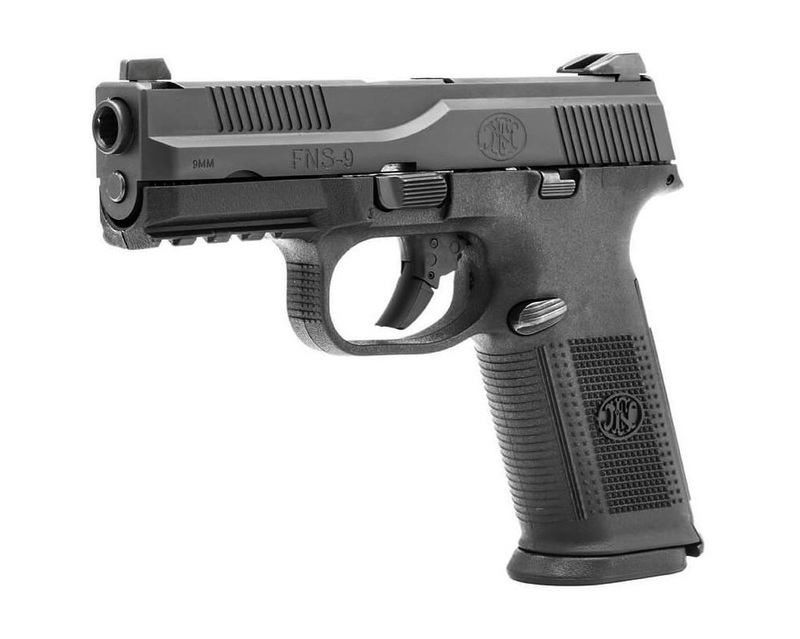 The FNS-9 is a somewhat concealable, striker-fired pistol with 100% ambidextrous controls. Out of the box, the iron sights, minimal controls, and metal magazines put it miles ahead of any Glock. It’s comfortable to hold and shoot and it’s plenty accurate. The FNS-9’s trigger is pretty bad. Because it’s so close in size to the G19 I’m going to ding it also for the long grip (should have kept it to 15 rounds!!!). But that’s about it; there’s not a lot to dislike about this fine pistol. The FNS-9 is very comfortable to hold and operate. I’d shoot the heck outta this gun any day. It’s easy to shoot well. I found it to be very accurate for its 4” barrel. I doubt you can outshoot the gun. This is a first-blush evaluation, so I can’t speak to real reliability. However, I found no issues in a few hundred rounds at the end of a 2000+ round string of shooting since its last cleaning. Other than some early-release-model hiccups (corrected), I could find no reports of reliability issues (some reports showed amazing reliability even when covered in mud/sand!). You can find good aftermarket sights for the FNS-9 and I’ll bet that triggers are on the way (one is recently release for the FN 509). Beyond that, there’s not much one might want to do for this gun. It’s that solid. Were I not a Glock adherent I wouldn’t hesitate to pick up this excellent pistol. Yes, the trigger is crap, but I’ve seen how one can improve that with rudimentary armoring skills. The long grip presents a bit of a hurdle for concealment in an EDC role, but everyday carry is about solving such issues. I’ll bet you can if you try. I cannot understand why this pistol is not mentioned more frequently and is not more popular among serious pistol carriers. It is the “comfortable Glock” and I think it deserves more consideration in gun culture. I hope you’ll give it a try. I bet you’ll love it. I have both the FNS 9 w/4 “ barrel as well as the FNS 9c. Love them both. In fact my XDE 9mm and XDS .40 both great guns have become backups to my FN’s. When choosing a 4″ barrel 9mm, I test fired the Glock 19, the Springfield XD(m) 3.8 9mm, and the FNS-9 – I purchased the XD(m) 3.8 and the FNS-9!! I love the FNS-9 so much, until I bought the FNS-9c as well; everyone that I know has fired the FNS-9 had never heard of it before but they ALL loved it!